Accent Plus Corner Shelf Wood, Corner Shelf Units Decorative White 4-tier Corner Shelf by Accent Plus at Home Decor Outlet Store. MPN: 34-EF78-4489. Hurry! Limited time offer. Offer valid only while supplies last. This white floating corner shelf is perfect for displaying collectibles, photos, decorative items and more. easily secures to bath shelf corner. 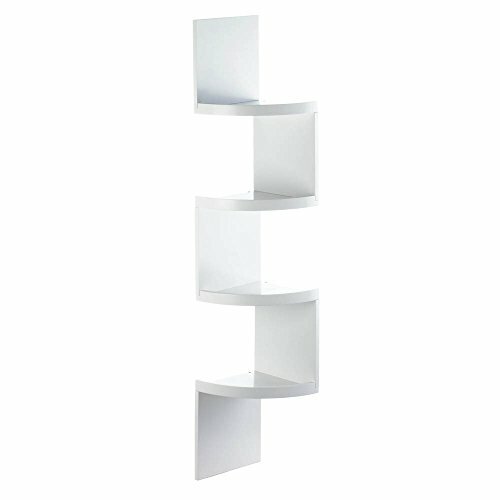 This zig zag wooden corner wall shelf white makes space utilization possible in any corner. this corner storage shelf using creative and space-saving design. This white wall corner shelf unit bathroom has four small shelves that you can use to display your favorite decor or collectibles. This incredible zig zag design bathroom corner shelf mount will take any empty corner of your room and transform it into a showcase of impeccable style. This wood corner shelf wall mount weight:12.6 pounds. the corner rack shelf dimensions:9.62" x 9.62" x 51"